During initial setup, TaskClone prompts you to connect your Evernote Business account if detected. After initial setup, when you login to TaskClone Settings, you'll see the option to connect your Evernote Business account under Evernote settings. 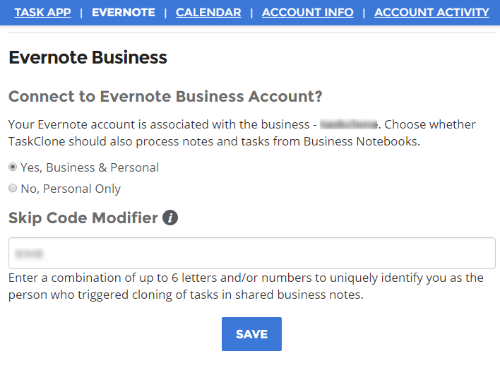 Note: Both our free trial and Business Plan support Evernote Business accounts. Actually, our basic Cloning Instructions work fine, but Evernote Business accounts are unique in a few ways that effect how those instructions work. Initially the Skip Code Modifier is set to the your initials, but you can change it in the TaskClone Dashboard in the Evernote Section. 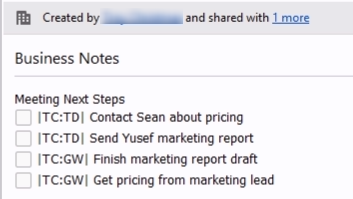 With the Skip Code Modifier, you can see which user cloned which tasks in a note. TaskClone will skip tasks with any version of the Skip Code that begins with "|TC"